The formation of cold agglutinins is frequently observed during Mycoplasma pneumoniae infections. Nevertheless, severe hemolysis is exceptional. We report a case of life-threatening hemolytic anemia caused by M. pneumoniae. 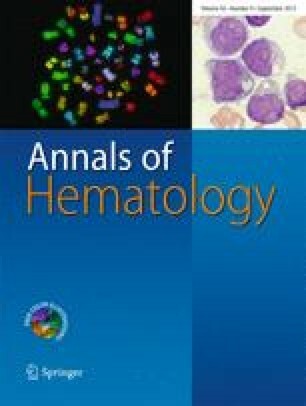 As the leucocyte count was excessively elevated, the differential diagnosis primarily comprised hematological malignancies. The presence of cold agglutinins indicated the correct diagnosis, which was confirmed by highly elevated levels of both IgG and IgM antibodies to M. pneumoniae and a chest X-ray suggestive of atypical pneumonia. The patient was treated with roxithromycin and showed a favorable recovery within ten days after admission. This case demonstrates that, even in patients with clinically mild pneumonia, M. pneumoniae may be the cause of severe anemia.